When you're having a swim, usually a jellyfish isn't exactly a welcome sight. So imagine taking in a dip in a lake filled with thousands of them. Well that's exactly what happens at Jellyfish Lake in Palau, which get its name thanks to the thousands of golden jellyfish that live there. And now, it's re-opened to tourists. Located on Eil Malk Island, part of Palau's Rock Islands, the lake (real name Ongeim'l Tketau), draws in visitors who can don snorkeling gear and go swimming in the lake waters, amidst all of the jellyfish. The jellyfish are actually harmless, although they do have stinging cells. However, their 'stinging power' isn't strong enough to cause harm to humans, although some visitors have claimed to feel the effects around sensitive skin, such as the area around the mouth. The lake, which is approximately 400m long and 30m deep, was initially closed after the population of these fascinating marine creatures began to decline, following a drought in 2016. However, new research conducted by the Coral Reef Research Foundation (CRRF) has indicated that population has rebounded, and is continuing to grow. Which means it's once again possible for tourists to swim in the lake without posing a risk to the creatures. 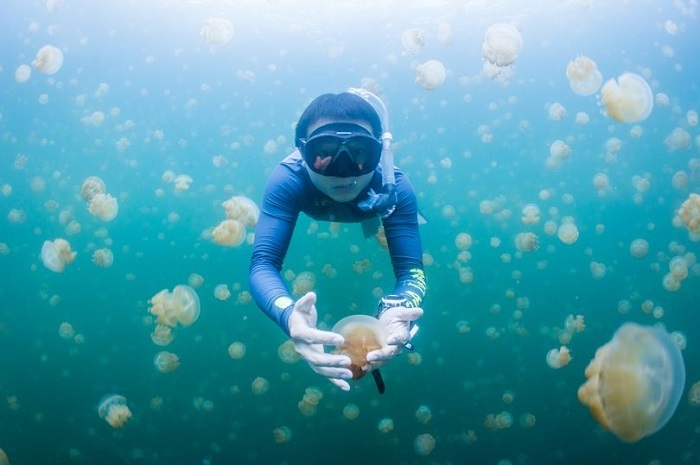 Although snorkeling is allowed, diving is prohibited because the bubbles can harm the jellyfish - not to mention that deeper depths in the lake contain high levels of hydrogen sulfide which can be dangerous to divers. There are still strong conservation efforts to ensure that the numbers of tourists don't damage the jellyfish and their home, and there will be environmental-focused plans in place to keep an eye on the situation. The lake is currently one of the very few in Palau which is opened to tourists; the region is renowned for being protective of its eco-system and working on conservation efforts.